So, you went for your first pregnancy checkup, and found out you’re having twins? Double the joy, double the stress, and double the responsibilities coming your way. From baby cribs to the best bassinet for twins, you need to be on top of everything to make sure you buy the right products for your babies to keep them comfortable and safe. Twin bassinets are a convenient and cozy choice. They are an excellent temporary solution as you bring your babies home. There are several options on the market to choose from and there are many things you should consider before buying the best bassinet for twins. Finding the right bassinet for your twins is critical to finding sanity in the initial weeks after delivery. To help you make an informed choice for your twins, our expert moms and dads tested over 50 bassinets for twins. In this guide, we’ll discuss your options in detail. We’ll also list the top 5 bassinets for twins on the market and review them one by one. Read on to know more. It is smaller and more portable than a full crib. Since it is compact, you can place the bassinet in your bedroom and make your kids sleep next to you so you can check on them throughout the night. The small quarters of the bassinet are more comforting for twins who are adjusting to life outside the womb. A bassinet is a lot like a crib, except it is more compact for traveling and portability. For easier access, the sides are lower, and it comes with a few unique features such as a cover for your twins when they’re sleeping. Also, many bassinets for twins come with wheels so you can use them for outdoor purposes such as walking with your babies, grocery shopping, etc. However, you can only use them during the initial few months after birth. Unlike cribs, they are not suitable for babies over 3 months. Almost all bassinets come with pockets and storage areas underneath the bassinet or on the sides. You can use the pockets and storage compartments to carry your babies’ diapers, feeding bottles, bibs, and a lot more. Some bassinets for twins also come with attached milk bottle holders. The functionality of the bassinet is important, especially when you’re planning a vacation with your twins. You’ll be surprised to know that these days, some bassinets can even be transformed into changing tables for your babies when they need a diaper change. Others can be attached to strollers for twins and folded too. If you’re someone who likes a little extra, you can also explore bassinets for twins with detachable baby baskets. Finding a bassinet for twins that is multi functional can be a great investment. Portability and movement is a matter of preference. If you’re someone who loves traveling, spending your day outdoors, or moving around in your home, a bassinet that is foldable, lightweight, smaller, and comes with wheels could be an ideal pick. You can also look at a bassinet that can be transformed into a hand carry-basket. However, be sure all features can be locked in place. Since your twins will be spending their maximum time in the bassinet, make sure it can support them and keep them safe. The bassinet should have a sturdy construction and a mattress that’s soft and sweatproof. If you don’t want to put your babies’ safety at stake, you should find bassinets for twins that are tested and certified by the American Society for Testing and Materials (ASTM) and the Juvenile Products Manufacturer’s Association (JPMA). Some bassinets for twins come with special mechanisms such as a quick release latch to transform the bassinet into a cradle that rocks softly. There are also some bassinets that sway if you lock the wheels and others that are battery operated. However, bassinets that sway can be a bit intimidating with twins. Understanding the weight limit is extremely important, especially when it comes to a bassinet for twins. The maximum weight a bassinet can handle should at least be equal to the combined weight of your twins. Apart from the weight, knowing how long you can use the bassinet can help in keeping your twins safe. While some bassinets can only be used for up to 3-month old babies, the others come with no age restrictions and weight is the only deciding factor. The breathability and structure of the bassinet walls are two vital features that you should not ignore. Some of the sturdiest walls are made of wood planks that are typically used for cribs. This ensures durability, stability, and comes with gaps in between so that your twins are able to breathe in any position. However, a majority of the bassinets for twins come with stainless-steel corners and mesh-type walls that ensure the safety of your twins and allow airflow inside and around the bassinet. So, even if your babies are facing the wall, they would be able to breathe conveniently. A canopy can block bright light or sunlight. So, if you want to read your favorite novel while your twins are sleeping, you don’t need to worry. Fabric or frilly canopies that cover bassinets look beautiful. Based on the important factors discussed in the previous section and extensive market research, our expert moms and dads have shortlisted 3 best-selling bassinets for twins. Let’s look at their detailed reviews one by one. Graco Pack ‘n’ Play Twin Bassinet is currently the best rated bassinet for twins on the market. It saves a lot of space and allows parents of newborn twins to get easy access to their babies throughout the night. You can place the bassinet in your bedroom or wheel it from one room to another as per your requirement. However, you cannot use it as a pack and play yard, as well as a twin bassinet at the same time. You’ll have to remove the bassinets to make the play yard accessible. The play yard is also quilted and comfortable. Once your twins outgrow the bassinets, you can remove them altogether and use the play yard. The twin bassinets come with canopies to create a soothing environment for your babies to rest. Another good thing about the product is its height. After a c-section, you won’t have to bend too low to lift your babies from the bassinet or play area. Since the bassinets are not separated, the middle support can droop. Overall, our expert moms and dads had a lot of positive things to say about Graco Pack ‘n’ Play Playard with Twin Bassinets. If you’re short on space and looking for a compact bassinet for twins, the Baby Trend Nursery Center can be a good choice. With Baby Trend; you’re not just getting a bassinet, you get a “rock-a-bye” bassinet with sturdy handles that allow you to lift your babies from the play area and carry them around your home. The wheelable bassinet comes with a brake, a one-hand locking mechanism, and you can make the most of the wheels to move the bassinet from one place to another. The flip away changing table allows you to change your babies’ diapers without moving them from the bassinet and the organizer helps in storing all the baby essentials in one place. The nursery center also comes with 2 toys and 2 sound machines or electronic centers that provide soothing and playful remedies, gentle vibrations, and a dim night light. All in all, the Baby Trend Nursery Center is a complete world in itself for your twins. The bassinets are constructed from a lush fabric and mesh sides for good ventilation and added comfort. You won’t get bassinet sheets or mattresses with the nursery center; the bassinet mat is padded enough. The only issue with the product is its price which is a bit on the higher-end. The HALO Bassinet Twin Sleeper Double Bassinet is a premium-quality, high-end bassinet for twins. It’s a single bassinet with a separator instead of standalone bassinets attached to each other. The mesh walls provide maximum breath ability and visibility and allow proper ventilation inside and around the bassinet. In the HALO Bassinet, your twin will be together and at the same time, sleep safely in their separate spaces. 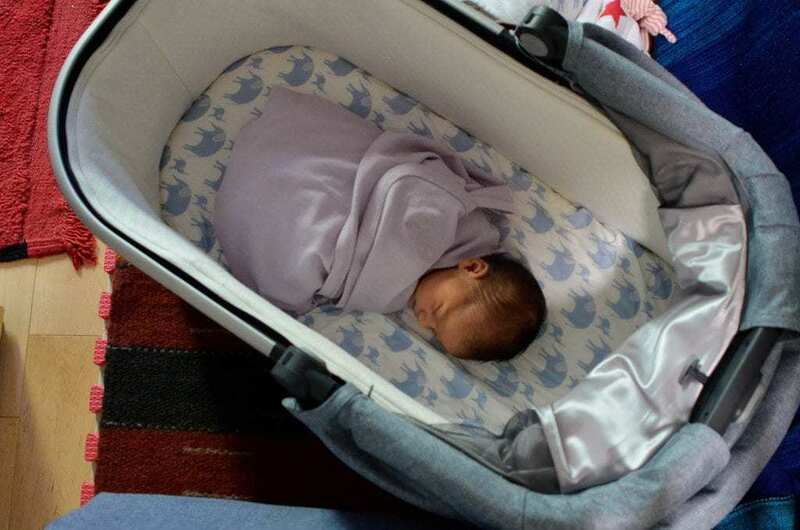 The smooth, 360-degree rotation of the bassinet allows parents to access either of the twins to sooth them or feed them at night without leaving their bed. To conveniently tend your babies, you can lower the side-walls or pull them up as and when required. It is best for moms who’ve undergone c-sections as they won’t have to get up off and on to check on their babies. The innovative design allows you to adjust the bassinet’s height from 24 to 34 inches depending on the height of your bed. The design of the bassinet even allows you to overlap your bed for maximum convenience and closeness. The HALO Bassinet comes with 2 polyester fitted sheets, 2 waterproof mattress pads, and 2 pure cotton fitted sheets. The soothing center comes with a 2-level nightlight, 2-level vibration, 3 soothing sounds, 3 lullabies, and a special back-to-bed alarm for moms with 30-minute auto shut off feature. The bassinet also comes with 2 storage pockets for easy access to baby essentials. All in all, the HALO Bassinet is an excellent product for new moms, especially those who’ve had a c-section. However, it’s more expensive than the other 2 bassinets for twins listed above. So, if you’re not on a shoestring budget and the price is not a deciding criterion for you, we recommend you try the HALO bassinet for utmost comfort and convenience. Choose a bassinet with a stable bottom and a wide base. Make sure the bassinet doesn’t have any pointed or sharp edges. Look for small parts that could be potential choking hazards. If you’re buying a bassinet made of wood, make sure it’s free of splinters. Check if the mattress or paid is firm, smooth, and fits properly. Also, make sure it’s not more than 1.5 inches thick to prevent suffocation. Check the folding mechanism and make sure the legs lock into place. Buy bassinets that are surrounded by mesh walls. If the sides aren’t airy, there’s a potential risk that your baby could choke. Say no to an heirloom bassinet. Don’t add bedding or stuffed animals to the bassinet as they can suffocate your twins. Now that you’ve explored the top 3 bassinets for twins chosen by our experts, what do you think about our experts’ choices? Have you found the one for your twins? Don’t worry if you haven’t; we don’t want to put you in a spot here. Take your time and see what’s best for your babies. Our expert moms and dads have declared the Baby Trend Twin Nursery Center as the winner. Even though Graco is more reasonably priced, the Baby Trend Twin Nursery Center is more convenient and comfortable for babies. Moreover, you can turn the bassinet setup into a rocker. Also, the freebies – the changing table and the deluxe organizer are very useful. If you talk about HALO, the double bassinet is draped with luxury and is value for money. However, it is not suitable for buyers on a shoestring budget. If the price is not a constraint, we would recommend you go for HALO without thinking twice, especially if you’re a mom who’s undergone a c-section. We hope you found the guide to the best bassinet for twins helpful. If you have any questions regarding the products mentioned in the guide, please post them in the comment section below. Also, if there’s any other bassinet for twins that we have missed and you’d like us to review, kindly write to us, and we’ll be happy to review the product for you. The Best Diaper Genie Alternatives - All You Need to Know!